Chandikeshwara is a form of God which is often seen along with Lord Shiva, In fact, almost all the shrines of Lord Shiva has a portrait of Chandikeshwara. It is believed that no worship is complete without paying visit to him and hence devotees make it a point to visit him prior to visiting Lord Shiva. There is a beautiful legend which unfolds the story of his place of worship. 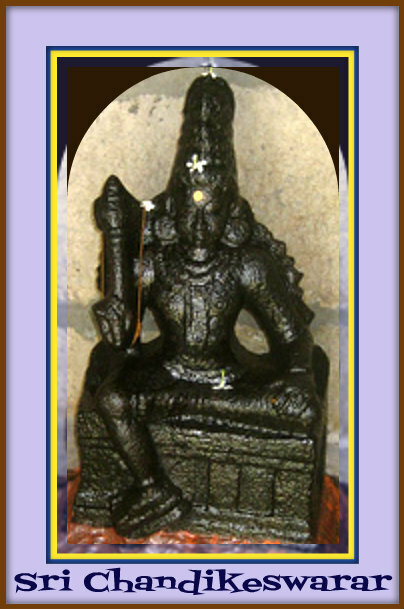 Since, Chandikeshwara was a small child; he was a staunch supporter and devotee of Lord Shiva. In fact, he used to make thousands of lingams of Lord Shiva and meditated in front of him all day long. The lingams where casted beautifully out of sand and he took pains to ensure that each lingam was perfect in its shape and structure. Further, he also used to mow the cows and take out the milk which then he offered to Lord Shiva. This was his usual activity. This usually bothered his parents since they were pissed with his activity of playing with sand and milk all day long. One day when Chandikeshwara went for his usual chore of milking the cow, his father entered the spot where he had made his lingams and started shouting at him. 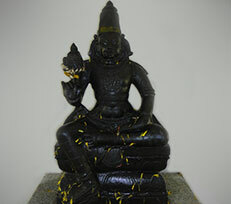 In order to find his son, he by mistakenly ruined one of the lingams by stepping onto it. This had been casted and kept by Chandikeshwara. This made Chandikeshwara angry and sad and out of anger he cut off the limb of his father. Pleased with such devotion and dedication, Lord Shiva gave darshan to Chandikeshwara and gave him a boon that his statue would always lie beside his own idol. He further, gave back his father's limb. Since, then Chandikeshwara has been found in all Shiva temples in a meditating posture, In fact, in order to distract his meditation and seek his blessings, devotees make different kinds of sounds with their fingers before entering the temple. One of the most significant temple dedicated to Chandikeshwara is located in the small city of Hampi, Karnartaka, Some of the temples are also present in Mysore and Basaralu. However, the portrait or image of Chandikeshwara is found in tadem with all the shiva lingams in all the Shiva temples throughout the length and breadth of the company. Puja which is offered to Lord Chandikeshwara is done along with the pujas that are offered to Lord Shiva. In fact, any worship is deemed complete only if worships Lord Chandikeshwara first, and then pave his path to seek the blessings of Lord Shiva. In fact one of the biggest puja's which is offered to Lord Shiva in the form of Pnachalingam puja is also started initially by worshipping Lord Chandikeshwara. One gets all kinds of wishes granted by meditating and undergoing deep penance like that of Chandikeshwara. He is offered flowers and bhogs. Aarti is also sung which is accompanied with hymns and chants prior to the main pooja of Lord Shiva.